The School Council decided that they wished to raise money for Cancer Research as one of their charities this year. One of the fund raising events was to take part in a fitness circuit which was organised by our sports coach, Jordan. This involved lots of activities including a bean bag and hoop throw. We hosted another charity fitness event, organised by Sports for Champions. 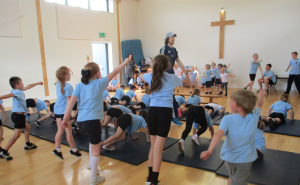 Rob Mitchell, a high jumper visited the school and ran an afternoon of sports activities. He even demonstrated some of his own sporting skills!